If you’re looking to build brute strength, you need to avoid machines and biceps curls. Instead, focus your time in the weight room on a small number of core exercises that hit the main muscle groups. It’s called keeping it simple—and it works. We selected three exercises: bench press, back squat and power clean. We called them the Big Three. The main reason the Big Three works well is that all the energy of an athlete is put into making the large muscles and corresponding attachments stronger. The main problem with routines that consist of numerous exercises is only so much energy is available. When it’s spread out over a dozen or more movements, none receive much attention. Therefore, we do not get stronger. It’s my observation that those in charge of putting together strength programs in high school, colleges and professional sports have reverted back to the same mistakes their predecessors made in the ʼ60s. There are far too many exercises in nearly every program I’m asked to examine. In truth, the athletes who are using this multi-layered concept aren’t getting that much stronger. They might get a little stronger, but not nearly as much as if they had applied all their energy to moving iron. Three is the operative number when designing a beginning strength program: three basic exercises for the three major muscle groups done three times a week. This program is equally useful to those starting back into a strength routine after a layoff, as well as those wanting to maintain a high level of strength fitness at any age. Simplicity is the key to success in strength training—so keep it simple. 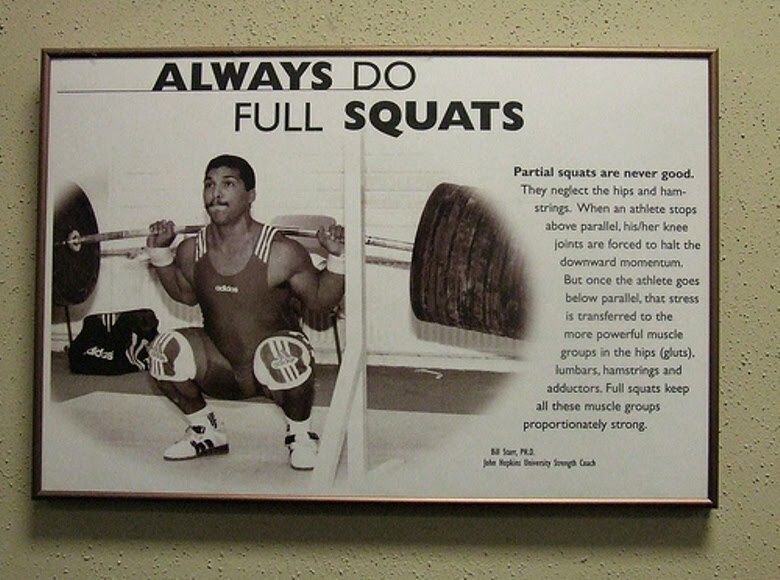 And yes, always do full squats. It's good to see Bill Starr still active and preaching the word. If you do no other workout ever, do the Big Three. I like this post but I can't figure out why it is called that. From my perspective, Starr is a prophet. There is a lot of bad advice out there. Why cleans instead of deadlifts? I like the cleans for working on coordination and strength in the extremities. Also, I don't do cardio, and cleans keep my pulse rate up. But deadlifts are great too. All right, AG, I took the challenge. After a few gym sessions....it's awesome. The most notable thing is that seriously, my posture's better. 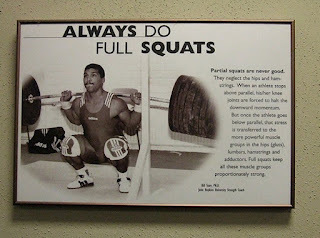 I suspect that the full squats make me concentrate on body alignment-much more important that buffed arms. For variety I will mix it up with incline, decline or military presses and hanging cleans and front squats. Every now and again I will work on lower and upper extremities when my knees and shoulders need a break. I also know folks who work on their arms after the big three. For max days, I just go with squats, deadlifts and a military press. They're probably the safest unless you have a spotter. Also, the order I keep coming back to is squats, then cleans, then presses. Thanks for the comments.